if you look at the after photo you can see a HUGE yellow crowbar that was a housewarming gift from my every-so-wise brother in law, husband of my lovely and talented sister (fringe). well, as you can see..there has been some major demo and 75% of it was because of our the biggest tool i have ever owned (i had no idea they made them that big) and some Brut force. so, more great news for the weary and blister ridden new homeowners. 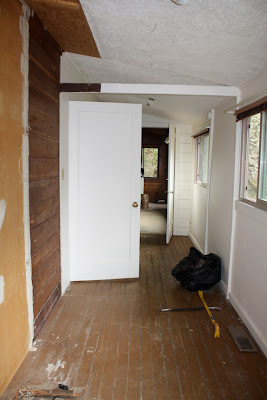 this entry was originally part of the wrap around porch that was converted into living space back in the 30's or 40's and it looks like the original painted plank floors are in tact. i have to say, i love this golden brown color and there is a possibility we just might live with this color for a while. much more charming and warm in person....i can't wait for your comments. 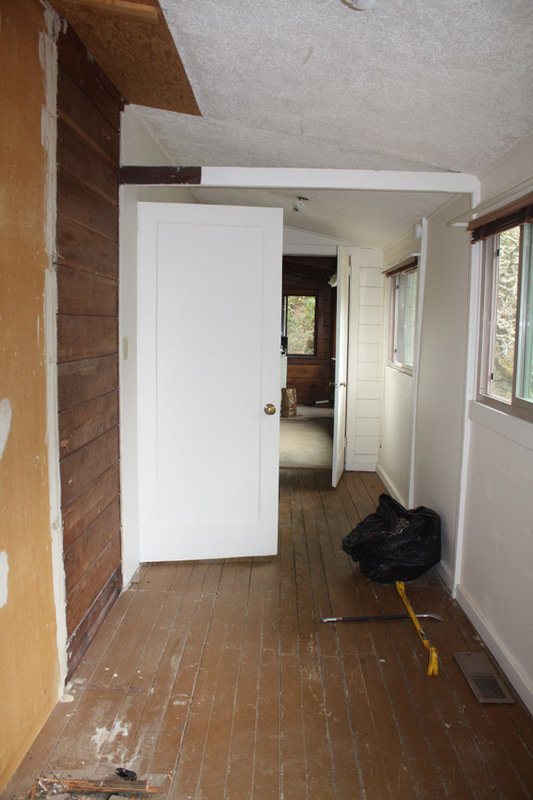 notice how that mammoth floor to ceiling cabinet removal opens this space right up. I feel your achey sore muscles, and you excitement! I am so happy that your sister and her sweet husband gifted you with your first bright spot of color in the new cabin! You know I have to approve! dude. is that a beer on the ladder? busted! too funny! you are at such an awesome point with the cabin...spending early fall weekends working on projects...that time will make great memories, not to mention great progress on your place. enjoy it all - even the hard work - it will be over before you know it! this is soooo exciting and i cannot wait to see it all... 2 weeks!! cranberry cottage- ha! i just loaded up on advil and am hoping to avoid any straining today. laura- of course you love the color...i knew you would. i have been on that gold trend for a few years now and you have exposed me. perfect grey - dude! let me tell you something. that was a beer (caught) and the funny thing is it was warm. yes, desperate times desperate measures. no fridge..no cold beer. red ticking- gurl....where were you when we needed you? don't you worry...there will be some weeding to be done when you get down here. So excited to watch your project. Been there a few times. It is pretty gratifying. At least get a cooler with some ice in it for the balance of the weekend. It already looks 10X better and the floors are great! R was thinkin with that crowbar gift...so clever! And yes...*cooler+ice=cold beer*! Stay strong & cool...and thanks for the update! Sooo...what you are sayin' is.. a ladder, a crobar...well..massive crobar....and a cervesa or two...= progress....?? ?...well hot diggity dog... I would have shown up with the ICE!!! So happy for you!!! this must be so exciting.. it is fun to see the transformation happening! YAY! 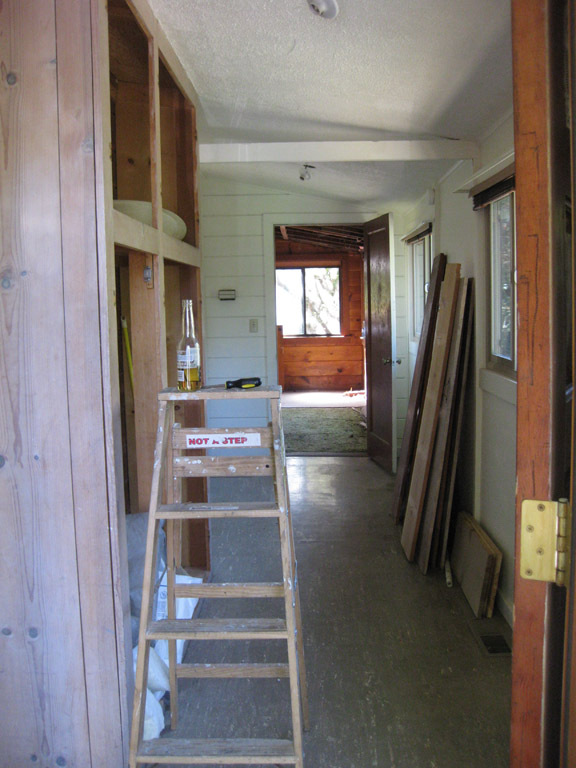 I would love to see a floor plan, it is hard to visualize from the photos so far. but don't want to impinge on your privacy.